Conveniently located next to The University of Missouri, Stadium Grill is THE destination for incredible food and college-sports! We are a casual sports restaurant and bar with freshly-made food at an incredible value. A place where making friends is as easy as ordering your next beer. So whether you're here to chill, cheer, chow down or get charged up, you'll find a whole House full of friends and friends-to-be, ready to join in. Everyone can find something they love on our menu. We are well-known for our award winning wings, tossed in your choice of sauces. From LA Honey Thai to the Spicy Buffalo, our 5 sauces will turn anyone into a wing lover! Our menu also features delicious KC Strip Steaks, original pasta dishes, bountiful salads, robust sandwiches, to-die-for desserts and lots of appetizers to share with friends. Our full-service bar features specialty cocktails like our Stadium Hurricane; a nice wine selection; and a large variety of local craft, seasonal and domestic beers. Fresh melted pepper jack & cheddar cheese with pico de Gallo. Served with chips and our signature salsa. Three layers of toasted wheat bread piled with smoked turkey, ham, bacon, lettuce, tomato, Swiss cheese, and spiced mayo. Fresh greens, tomatoes, croutons, cheddar cheese, cucumbers, and choice of signature dressing. Layers of colossal hand-breaded onion rings with honey mustard and spicy BBQ sauce. Sizzling-hot hand-cut 12oz. strip steak topped with an onion ring and served with your choice of two sides. A St. Louis classic filled with savory Italian sausage and cheese. Served with warm marinara. Breaded chicken tenderloins tossed in our spicy wing sauce with a side of ranch. A sharable portion of boneless wings tossed in our buffalo sauce, mozzarella sticks & toasted ravioli served with marinara sauce. Three panko-breaded Creole crab cakes served with zesty house remoulade. Crispy breaded dill pickle chips with house ranch and grill sauce. Tortilla chips topped with queso sauce, cheddar cheese, jalapenos, sour cream, guacamole, pico de gallo and black olives. Topped with our honey BBQ sauce, hickory bacon and cheddar cheese on a fresh roll. Sliced sirloin with Swiss cheese on a toasted baguette served with au jus. Crispy breaded pork tenderloin with lettuce, tomato, and onion on a fresh roll served with a side of mayo. Crispy breaded chicken breast tossed in buffalo wing sauce on a Hawaiian bun with Swiss cheese. Served with lettuce, tomato, onion, pickle and ranch dressing. Three panko-breaded crab cakes on Hawaiian rolls with our zesty remoulade. Your choice of sliced prime rib or juicy shredded chicken breast piled high on a toasted artisan baguette with chipotle cream cheese spread, sauteed peppers, caramelized onions and melted pepper jack cheese. Pork burnt ends served open face on Texas toast with BBQ sauce, pickles, and red onions. Chicken tenders tossed in a spicy buffalo sauce with cheddar cheese, diced tomatoes and chopped lettuce in a whole wheat tortilla. Fresh greens, tomato, cucumbers and croutons served with a side of ranch dressing. Topped with breaded chicken tenderloins tossed in our spicy wing sauce. Crisp Romaine lettuce topped with seasoned steak, pepper jack cheese, corn and black bean salsa, roasted red peppers, diced tomatoes and tortilla strips with our chile ranch dressing. Chopped romaine, Parmesan and croutons in a creamy Asiago dressing. House salad or small Caesar salad with a cup of today’s featured soup. Crisp romaine and spring greens topped with Genoa salami, provolone cheese, artichoke hearts, roasted red peppers, diced tomatoes and served with our St. Louis-inspired vinaigrette. Romaine and spring greens topped with large Cajun-spiced shrimp, roasted red peppers, cucumbers and diced tomatoes. Served with our zesty Creole Vinaigrette. 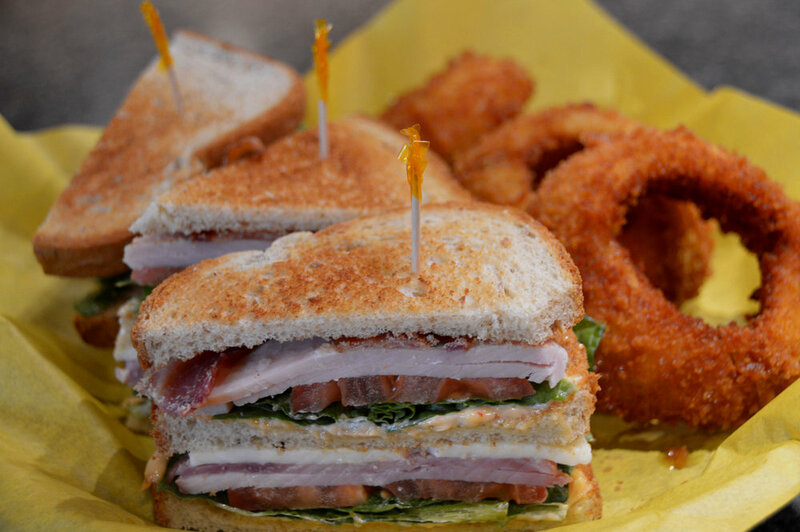 Fresh greens, turkey, ham, bacon bits, tomato, croutons, cheddar cheese served with a side of ranch. Baby spinach tossed with bacon, red onion, roasted red peppers, feta cheese, dried cranberries, and almonds. Served with your choice of dressing. Pepper jack cheese, jalapenos, and our insanely hot sauce. Louisiana sausage, sautéed bell peppers and onions, pepper jack cheese, and grill sauce. Topped with pineapple salsa and served with rice pilaf and fresh steamed broccoli. Beer battered cod with tartar sauce, malt vinegar and lemon wedges. Sausage, Creole-spiced shrimp and grilled chicken breast with sautéed peppers, caramelized onions and fettuccine noodles in our bayou cream sauce. Choice of grilled sausage, Mahi Mahi, or grilled chicken. Served with house-made corn bread. Zoodles tossed with mushrooms, broccoli, and tomatoes in a red sauce topped with Parmesan cheese. Grilled hand-cut 12 oz. 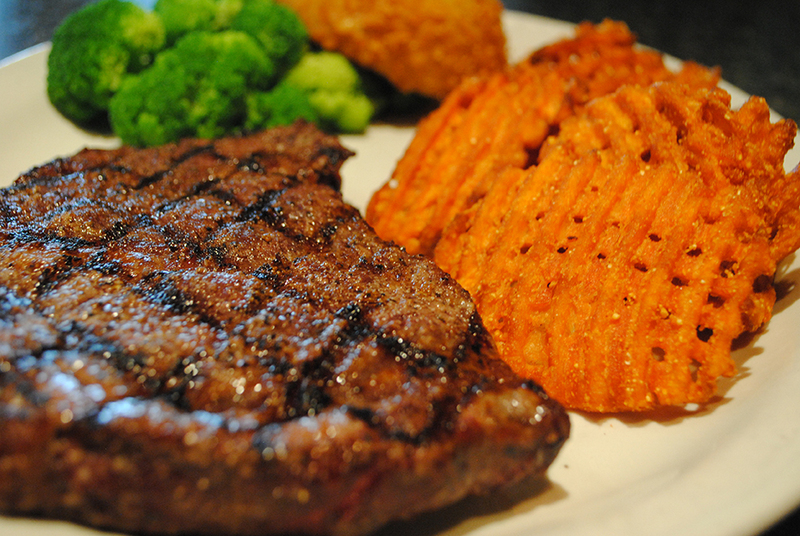 strip steak topped with an overtime onion ring and served with your choice of two sides. Meatloaf smothered with sautéed portobello mushrooms and bell peppers, Creole gravy, and shoestring onions. Served with garlic mashed potatoes. Two chops topped with chipotle lime butter served with choice of two sides. Hungry? We now offer delivery to Columbia residents on Order Up! Thank you for signing up for Stadium GrillRewards! Sit back and relax. Let us set-up the buffet for your event so you don’t have to mess with it. It’s important to us that your event is flawless and that our food is perfect. Our friendly staff serves your guests so you can mingle and enjoy your event to the fullest.